Store Your Favourite Vintage Complete your kitchen with this stainless steel 60cm integrated wine cooler. A design that will look beautiful in all modern kitchens, this really is an appliance you do not want to miss out on. 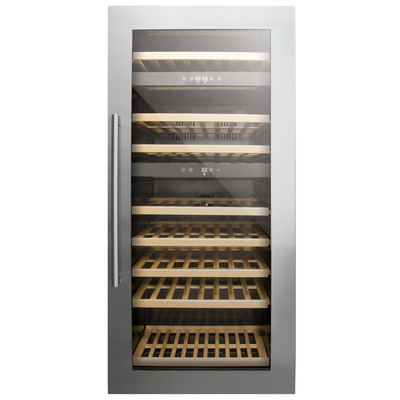 This impressive wine cooler offers a triple zone feature which means you can store wines at three different temperatures ensuring every bottle is cooled perfectly. The cooler features an adjustable digital thermostat for ideal temperature control. Each zone offers 3 different temperature ranges: 5 – 11 degrees, 11-13 degrees and 14-22 degrees. These can be monitored on the cool blue LED display panel. You can store up to 61 bottles neatly on modern wooden shelves and they will be presented nicely with a white LED internal light. This elegant model will fit effortlessly in any household and is perfect for parties at the weekend. Please Note Please check the dimensions before you purchase. Items that do not meet your measurements must be returned at your own cost. Please do not organise fitters or book days off work for the installation of appliances until you have received your products. We cannot be held liable for any costs incurred relating to this.